The title is admittedly a bad pun. 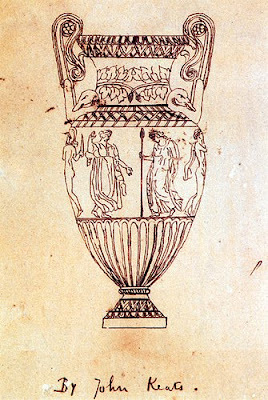 In case you are unfamiliar with it, the title comes from John Keats classic poem "Ode on a Grecian Urn," and the final lines are what's quoted above. Keats is one of the poets I study and seeing as I'm waist deep in reading and writing despite it being my spring break, I thought I'd share it with you. He's not one of my personal favorites, nor is the poem one of my favorites to study of his poems. The poem's simple language and complex imagery makes it enjoyable to read and momentarily get lost in. The decades of people writing about it make it a pain to write about though. What inspired the post was not Keats though, so maybe I should keep on topic. Initially at least.What did inspire this post was a wonderful surprise comment from Stonyfield offering a few coupons to sample some of their Oikos Greek Yogurt. Now, dairy products in general are one of my weaknesses. I don't know what I would do if I suddenly awoke with a dairy allergy. Granted, I love scones and breakfast pastries, but more often than not I prefer some greek yogurt and a little bit of fruit to go with my morning coffee. Peaches or blueberries when they're in season especially. Anyway, the point being that I was quite ecstatic when the coupons to try them came in the mail. Not only was it the first free sample we received, but it was for something that I love on top of that. Almost like getting paid to sit around and read poetry. More like to try in whatever way possible to motivate students to do so, but whatever. Most of you are probably familiar with Stonyfield, and if you watched Food Inc., you may have seen that they are one of the larger companies that support farm's with better environmental and health practices.On top of that, they make some tasty greek yogurt. I wanted to try out a few different approaches as I didn't figure you would be all to excited to see my routine breakfast up for your perusal. One of the first things I thought about using the yogurt for though was in an ice cream. The weather has been nice here lately and I've had amazing success using greek yogurt for ice cream before in a Peach Ice Cream and a Bacon Ice Cream. The creaminess of the yogurt carries through to make an intensely smooth and rich frozen treat. So I pull the ice cream freezer out to get it ready and it is inoperable. Alas. "Heard melodies are sweet, but those unheard are sweeter, therefore; ye soft pipes play on." Still wanting to use it some sort of tangy dessert application, Daniel mentioned he was in the mood to make a carrot cake. PERFECT. "How about a carrot cake with a greek yogurt topping" I suggest. He grimaces, but concedes. The carrot cake recipe we used came from was adapted from Michael Richard's Happy in the Kitchen, and was originally designed to help compose a carrot-cake-orange-sauce-cocoa-puff-ice-cream concoction. Intense, I know, and maybe for another day when we aren't starting at 11:30. Perhaps because it was designed to be go into ice cream, or perhaps because of the late hour we initially made the cake, it was quite crumbly, but super moist and delicious nonetheless. The orange-carrot caramel sauce made for quite a sweet cake, and the thin layer of greek yogurt across the top offset sweetness perfectly and let you really enjoy the subtly of the carrot and burst of ginger and spices. As soon as our ice cream maker is repaired, there will be a round two in the immediate future for this concoction. 2. Combine almond meal, flour, baking soda, cinnamon, and salt. In another bowl, mix maple syrup, butter, and eggs until well combined. Combine wet and dry ingredients, mix until combined. Add ginger and carrots. Pour into prepared pan. 3. Sprinkle the pecans on top. Bake approx 25 minutes until brown on top and cake tester comes out clean. Transfer to cooling rack and let cool completely. Remove from pan and chill completely. 1. Stir sugar and water in medium heavy saucepan to moisten. Place over medium heat and bring to a boil. Reduce and simmer without stirring for about 10 minutes or until amber in color. Have pastry brush with water on hand to remove any sugar that crystallizes. 2.Meanwhile, combine carrot juice and orange juice in saucepan and heat until warm. When caramel is ready, remove from heat and stir in juice gradually. The caramel will bubble, so be careful Return to heat and simmer 20-30 minutes until reduced. Once done, refrigerate in a covered container. Remove cake and sauce from refrigerator. Place on serving plate. Carefully spread caramel mixture on top of cake. Allow to rest for a few moments. Spread about one cup Oikos Vanilla Greek Yogurt in a thin layer on top (we used one 5.3 oz container and one 4 oz container). Cut, serve, and enjoy! 1. Thaw corn in fridge. Toss with 1 tbsp olive oil and a dash each (1/8 tsp) salt and pepper. Heat heavy saucepan or large nonstick skillet over medium-high heat. When pan is hot, add corn, stirring quickly. 1-2 minutes. Add shallot and continue to saute until shallots are softened. Add vegetable stock, lemongrass and ginger. Simmer 8-10 minutes. Remove from heat. Discard lemon grass. Add salt and pepper to taste. Allow to cool slightly. Using blender, carefully puree soup to desired consistency. If desired, thin with water. Season with salt and pepper. Allow to chill for at least one hour. 2. Before serving, combine greek yogurt and lemongrass. Divide soup between cups or bowls and top with yogurt and cilantro (if desired). The original recipe I looked at suggested that you press the purred liquid through a sieve to remove any solids from the corn. Daniel's not a big fan of purees that lack no texture for some reason, so I left them for the additional texture and the slightly more chowdery feel. The soup is everything a summer soup should be. Sweet, simple, and refreshing. For a full version of the poem, please feel free to go here. On second thought, that's not all! After the response Daniel had for his sourdough on the last post, we've decided it's time to host OUR VERY FIRST GIVEAWAY!!! Although the process of making a sourdough starter is extremely rewarding, it's rather time and space consuming. After the first few weeks of a mere bowl on the counter, the containers multiply and subdivide, taking up most of very sparse kitchen space. The particular recipe we used made several containers, and because you continually replenish it once you have some ready, there's little need (at least for us) to have more than one or two. Knowing that some of you may be in the same boat we are, we thought some of you may like the chance to win a container of sourdough starter (as well as instructions as to how to keep it alive of course). The rules will be pretty simple, just become a follower of the blog and/or leave a comment on the post saying you'd like to be entered to win. On Thursday, we'll close the contest, run the participants through a random generator, and pick a winner! Either Thursday night or Friday. We'll contact the winner ASAP and announce it on the blog. That's it! That's almost a month of labor handed over to you! Good luck and hope you enjoy! Congratulations to Christine at Fresh Local and Best! I must admit that I am infatuated with sourdough and everything that has to do with it at the moment- from the simple biga so revered by the Italians to the French sourdough with all its simple glory. The biga as delightful and fun as it is to say, is not what I want to revel in during this aside. I have yet to delve into the realm known as German rye bread and there are a multitude of options when it comes to the formulas of white flour to rye, wheat flour to rye, and even a combination of the three. I am still utilizing a grape sourdough starter from The Modern Vegetarian Kitchen that has been working splendidly, but there are apple sourdoughs, strictly bread and water sourdoughs, and those unknown to me yet that may be experimented with down the road. The first sourdough I tried with my starter is very similar to the recipe in Modern Vegetarian Kitchen which produced two marvelous baguettes with astounding hole patterns. Rather time consuming, but who would not rather be tinkering in the kitchen than thinking about work, bills, etc. The recipe produced an amazing baguette, fitting of Parisian riverside picnics. Combine water, starter, and honey and stir until starter is dissolved. Add the flours and mix until roughly incorporated and let stand 5 minutes. Scoop sough onto clean floured work surface and knead for at least 10 minutes then let rest for 15 minutes. Uncover ball and sprinkle salt onto work surface kneading into the ball for at least 5 minutes. Avoid using excess flour, instead flouring hands to prevent ball absorbing too much flour. Place into an oiled bowl and coat ball with oil covering to let rise 4-6 hours until tripled in volume. Punch down and cover ball in bowl for 8-12 hours in refrigerator. Remove from fridge and let dough come to room temperature for 2-3 hours. Divide into two balls and roll balls into torpedo shapes with seam on bottom. Set torpedoes on floured surface sifting a thin sprinkle of flour on top and let rise at room temperature for 1 hour. Meanwhile preheat baking stone in oven to 500 degrees. Score loaves lengthwise, place an ovenproof bowl of cold water in oven to increase initial spring, meal baking stone, and place torpedoes on mealed area. Turn oven to 450 degrees and bake approximately 25 minutes or until loaves have a hollow sound like a drum on the bottoms. Let rest 10 minutes and enjoy with myriads of options. The rye bread was an adventure that I seem to frequent, known as the learn as you go method. I can rarely follow recipes, which is why Dawn oftentimes gives me strange looks with my flavor combinations. A few days ago she gave me the look when she smelled cardamom on the cauliflower, but you just never know. In my book there are few ways to learn much better than experience, and this rye bread turned out to be such an experience. The rye bread I made proved to be complex and hearty with an added mellowness combined with a rich molasses finish. And I must add, if you have yet to add rye bread to your baking scheme, it is worth the time and effort especially with rich meats and robust veggies. Stir together wet ingredients in a bowl until sourdough is thoroughly incorporated and let sit 5 minutes. Add flours and stir until it forms a ragged ball. Let sit for 15 minutes. Turn ball onto clean floured surface and knead for between 10 and 15 minutes. Cover the dough ball with the bowl and let rest 20 minutes. Spread salt onto work surface and knead salt into the dough ball for approximately 5 minutes. Place ball into floured bowl and cover allowing to rise at room temperature for 1 to 2 hours or until doubled in volume. Punch down and sift a blanket of flour on top and let rise at room temperature for 7 hours or until tripled in volume. Have baking stone preheated in 450 degree oven for one hour. Carefully score boule in criss-cross or whatever pattern you fancy. Bake for 45 minutes to an hour depending on weather and oven on mealed baking stone. Boule should sound hollow as a drum beat on bottom. I'm not sure how the weather has been for everyone else these last two weeks, but here it has been absolutely gorgeous. Rather than quickly jaunting from place to place, I found myself slowing down to enjoy the perfect early spring weather. As soon as Daniel or I got home, the windows were opened to take in in the crisp spring air. To celebrate being one step closer to the Farmer's Markets that will kick into gear later in the spring, I put together this bright Friday Night concoction. The cornucopia of possibilities that instantly spring to mind as I take a precious ball of our pizza dough from the freezer is perhaps the single reason Daniel and I enjoy making pizza so much, and do it so often. You may notice it comes up often on here, but trust me, there's plenty of more pizza baking going on, usually about one a week.. There's just so much you can do with a few simple, straightforward ingredients and flavors. For this particular pie, for example, I went through a few different possibilities. Originally planning for an arugula centered concoction, I was disappointed to discover its absence, as the fresh produce is at that odd juncture between winter and spring. Instead, I replaced the peppery bite of arugula with the sweet refreshing bite of the green pea to make a bright green sauce for a vivid March welcome to spring. 1. Place pizza stone in oven and preheat oven to 475 at least an hour before cooking. 2. Lightly cover pizza peel with cornmeal to prevent sticking. Stretch pizza dough to desired size. Spread pizza dough to coat pizza thinly. Top with onions, prosciutto, and grated parmesan. 3. Place cornmeal on pizza stone and carefully slide pizza onto stone. Bake 10-12 minutes. Remove from oven once crust begins to brown. Let cool slightly before cutting. *Garnish with additional parmesan cheese if desired. 1. Combine all ingredients except salt and pepper in blender. 2. Puree, blending until smooth, adding extra olive oil if needed. Mixture should be smooth but will be thick. Season with salt and pepper to taste. So...before our big 24,24,24 dinner, we had managed to be somewhat consistent writing posts. After a week of hogging the computer before finals, and now starting to write final papers, I realize that if I don't post now, half the month will go by without a word from either of us. As I've mentioned before, while I'm busy and stressed I take a lot of baking breaks. So, given the chance we wont be doing much posting or commenting for the week, I thought I'd give you a glimpse of what I would be and have already been doing. With the cultural rise in interest in vegetarian, vegan, organic, and local lifestyles, there are now a lot more alternative recipes for sweets that are more 'friendly' to some of these different groups. When I was sorting through the pantry, I found a can of pumpkin I had reserved in anticipation of a Thanksgiving pumpkin shortage. It slowly migrated to the back behind cans of tomatoes, but was rescued to make a fudgy dark chocolate, vegan friendly cookies. For some time, as I spotted vegan bakeries popping up around Columbus, I was quite skeptical as to how, without butter, or eggs, a cookie could be a cookie, a brownie a brownie, etc etc. Then, I was fortunate enough to try half a cookie here, a brownie there, and even a piece of cake. Although my attempt with these cookies is nowhere near as good as any of those yet, and I would perhaps rethink the whole wheat flour choice in favor of whole wheat pastry flour or a whole wheat and oat flour combination, they were very rich, chewy fudgy chocolate cookies, perfect for a 3 am pick-me-up. 2 tbsp sugar to coat. 1. Preheat oven to 350. Combine sugar, pumpkin, vanilla and maple syrup until smooth. 2. In separate bowl, combine flour, baking powder, baking soda, salt, and cocoa powder. Combine well. 3. Add dry mixture to wet mixture. Add chocolate chunks, fold to combine. 4. Scoop rounded tablespoons. Roll into balls, and dip in sugar to coat top. Place dough onto baking sheet lined with parchment paper and slightly flatten (these don't spread hardly at all). Cook 10-12 minutes. 5. Remove from oven. Cool on wire rack. Enjoy when cooled completely. Moving away from the vegan friendly cookies, I've been using flax seed as an egg substitute quite frequently lately. This somewhat middle ground bar cookie works well as a nice good morning breakfast treat. I think after a disappointing purchase of a bland, tasteless, cardboard like oat bar from a campus coffee shop, I'm trying to make up with my own renditions. The fact that I don't spend much time rolling out the cookies, and they bake 30 instead of 8 minutes, is a plus too! The orange zest gives the bars a unique taste to compliment the incredible chewy but crumbly texture of the oat bar and bursts of tart sweetness from the cranberries. This was my second attempt at these (the first were gone too quick to get pictures), so I hope you can maybe find some use for them. 1. Preheat oven to 350. Combine butter, sugars until creamy and pale brown in color. Add flax seed dissolved in water and orange zest. Mix well. 2. In different bowl, combine flour, oats, baking soda, and orange zest. Mix well. 3. Add dry mixture into wet mixture. Add cranberries and mix well. 4. Spread mixture in square 9x9 ungreased baking dish. 5. Bake about 30 minutes, until toothpick inserted comes out clean. Look pretty boring, I know. Looks more or less like the same recipe for the cranberry orange ones, huh? Wrong. Suffice to say, unlike the chocolate cookies, these are most definitely not vegan, or vegetarian friendly cookies. Besides the butter, and eggs in these, the nice pieces you see are not some dried fruit. Nor are they some nice toasted nuts. Nope, instead, what you see my friends, is some nice, sweet, smokey and salty, candied bacon. Yup, this is when you realize you've gone perhaps too far. Suffice to say, once I pulled these out of the oven, I quickly decided that was enough baking for a little while. Now off to find some hungry stressed colleagues to feed all these to! *Optional, once spread in pan, top with 1/4 cup pecan pieces. For the candied bacon, you can do a Google search for more precise directions from a number of bloggers, but basically, coat thick slices with brown sugar or maple syrup, and place on some sort of non stick surface or roasting rack for 20-30 in 350 oven.